The last two days were spent at the annual SSCA GAM. Basically a convention for cruisers; there are seminars, vendor booths, demonstrations, and round table discussions. It is a very social event, we meet a lot of people who have traveled through the places we are planning on going, catch up with local friends we haven’t seen in awhile, and even got to know sailors from our own marina. We hit the seminars pretty hard. First up was one that was supposed to be about safety and security and ethical issues with customs in the Caribbean. It was a total waste of time. Not one piece of helpful information was presented. Next up was one on taking better photographs while cruising. The presenter Jim Austin did a wonderful job at tackling issues specific to sailors. I learned how to better capture dolphins and birds, how to take photos of people in a cockpit, and how to make the million and two gorgeous sunset photos that I hope to take more interesting. (So hopefully, the photos posted on this blog will begin to improve.) A funny part of the class was when a woman was asking why her pictures of large waves were not coming out. The instructor was asking things like “are they blurry”, “is the color off”? I laughed because I knew the woman was trying to say “why don’t the waves look scary as crap in my photo?” Guess I am not the only one who has had that problem. We then started of this morning with a topic a little easier to digest-fishing while cruising. It was an information packed hour, I think Keith already knew most of it. But since my fishing has really been limited to pole spearing, I found it useful. From there, we caught the presentation from Chris Parker (the weather forecaster guru for the Caribbean). Not only is he famous for his excellent forecasts, but he has a true talent for explaining the how and why of weather. A natural teacher. A very informative and enjoyable hour. Before and after and between the seminars, we poked around the vendor booths. Most of our time was spent at the radio communications booths getting more and more confused and seeing more and more dollar signs. We did manage to break away and make a few needed purchases. 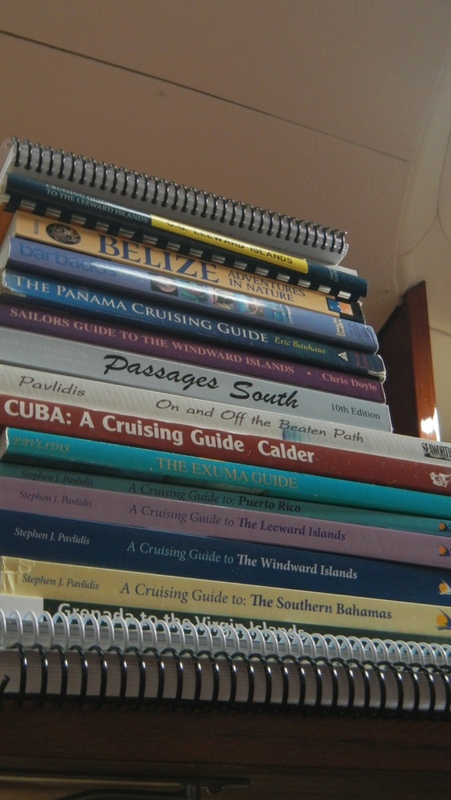 Keith scored our third solar panel and I picked up the last of the cruising guides I was missing from our list. Up next is the marine flea market in the morning. Please, please, please let us find some scores! Have you used the bahamas guides before when you were there? I am trying to gather info on which ones have worked best for people so I can narrow down my choices. There are so many to pick from! For the Abacos we rely on Steve Dodge The Cruising Guide to the Abacos. For the rest of the Bahamas, that we have gone to, we found the Pavlidis books good and that is what I am planning on using still. For charts, The explorer charts are highly recommended. I was so overwhelmed trying to pick guide books for the rest of the trip. I just kept taking notes every time in heard a review. Hope I chose well-they were expensive! Do you have an idea of where you are planning on cruising in the Bahamas yet?